Other information Description: This is a mint condition 2007 SKYTRAK TELESCOPIC TELEHANDLER FORKLIFT model: 6042 that is in GREAT CONDITION. GREAT PNEUMATIC DRIVE & STEER TIRES, JOHN DEERE diesel engine. 6,000 LB lift capacity, fork lift height 42 FEET. Unit features 4 ALL wheel pivot steering. Hydraulic frame level. Three Speed Forward/Reverse. 4 WHEEL DRIVE. allows for attachments to be FRESH FACTORY PAINT, SERVICE & DECALS. Low hours well maintained lift. Ready for work. 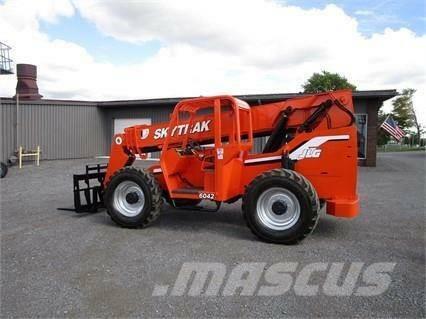 It is very rare to find a 6,000 LB JLG lift that is in such great condition. DEALERS would charge you $95,000 FOR THIS LIFT BRAND NEW. Call me with any questions at 716-568-4135 - available 7 days a week. ONLY 3,232 HOURS, FINANCING AVAILABLE FOR ALL CREDIT TYPES. OWN THIS LIFT FOR ZERO down and $988 per month.